June 27th marks a very special auction held by Be-Hold, which focuses its lens on stunning, groundbreaking photography. 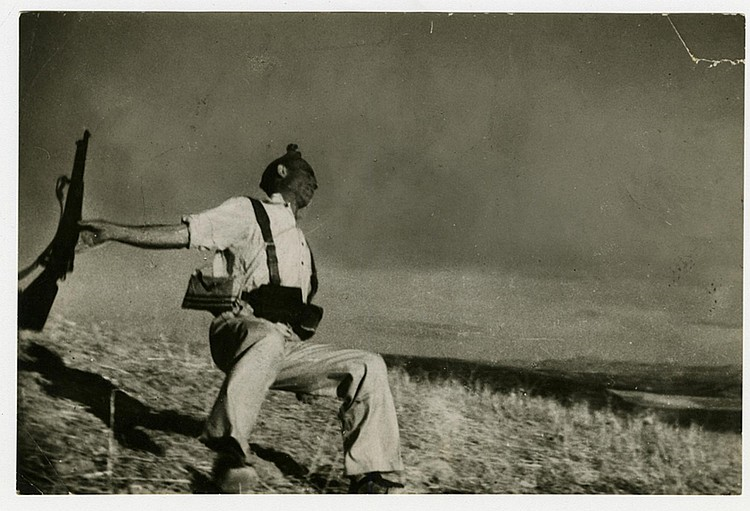 Barnebys zooms in on the work of the renowned photographer Robert Capa who covered two of the century’s major wars and thus became one of the 20th century’s most important photojournalists. Here are our top picks. This caption can be found on one of Capa’s most famous photographs from 1936. 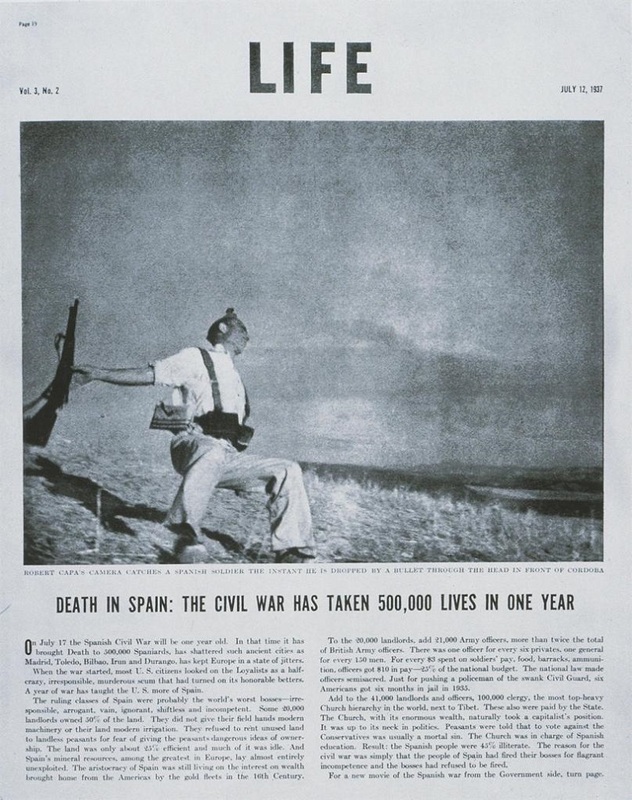 Black Star was the first agency where Robert Capa worked, one of the firms to provide LIFE magazine with photographs. Death of a Loyalist Soldier which was published in the magazine for July 12th 1937 had actually been published in the French publication Vu Magazine the year before. Since being published in LIFE, the photo has been printed numerous times with slightly different titles – Loyalist Soldier, Falling Soldier, Loyalist Militia and Death of a Militia Man. It's considered as one of the best documentary photographs ever taken. Photograph by Robert Capa, LIFE magazine. Photo: Be-Hold. Capa took the photograph during the Spanish Civil War during the time he spent in the trenches with the Republican soldiers. The photographer was deeply engaged in the anti-fascist movement. 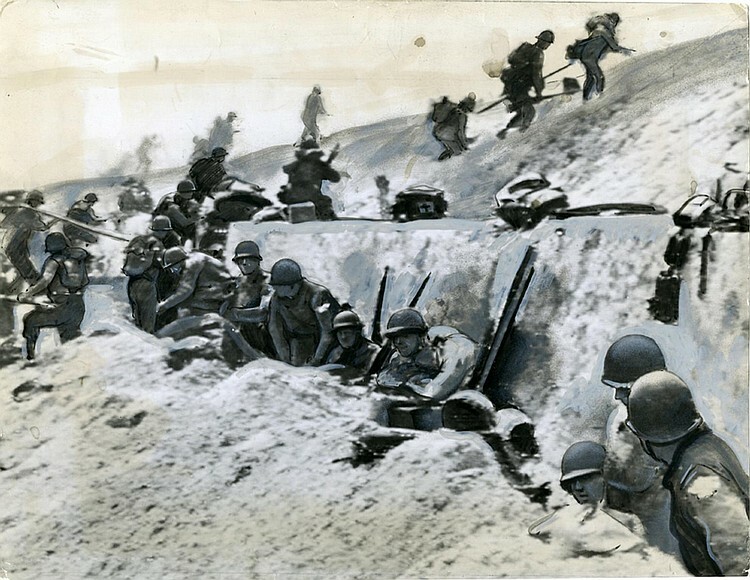 In a radio interview from 1947, Capa described how the Republican soldiers left the trenches to fire their old, outdated rifles at the enemy and fight against the advanced machine guns carried by the troops loyal to Francisco Franco. During one of these charges, Capa did not bother to look through his viewfinder but instead held his camera high about his head and started pressing the shutter. He had just captured one of the best combat shots ever taken and the first one to show death at its precise moment on the desolate battlefield. The image is full of drama and movement, capturing the soldier’s sudden death in mid air. This photograph, along with 14 others, were acquired by the current owner who is a private Spanish collector. These will be auctioned off later this month on June 27th. ROBERT CAPA. "Ruins of Agrigento". Silver gelatin (1943). Photo: Be-Hold. 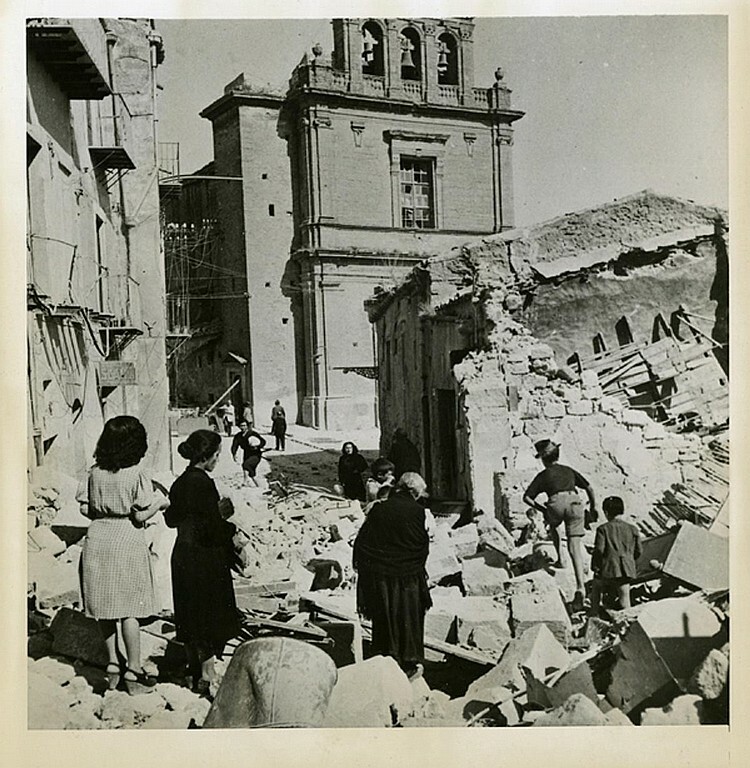 Ruins of Agrigento was taken on July 13th 1943 and on the back is written: "OUT OF HIDING… As the noise of battle ceases, residents of the captured city of Agrigento come out of hiding. Picking their way over the rubble from bombed buildings that clutters this street, they make their way back into town to welcome and cheer their victorious liberators as they march past." A copy of this photograph is included in the collection of the International Center of Photography (ICP) in New York City as well as in the archive of the international photo agency Magnum Photo. ROBERT CAPA. "Treating German soldier". Bastogne (1945). Photo: Be-Hold. 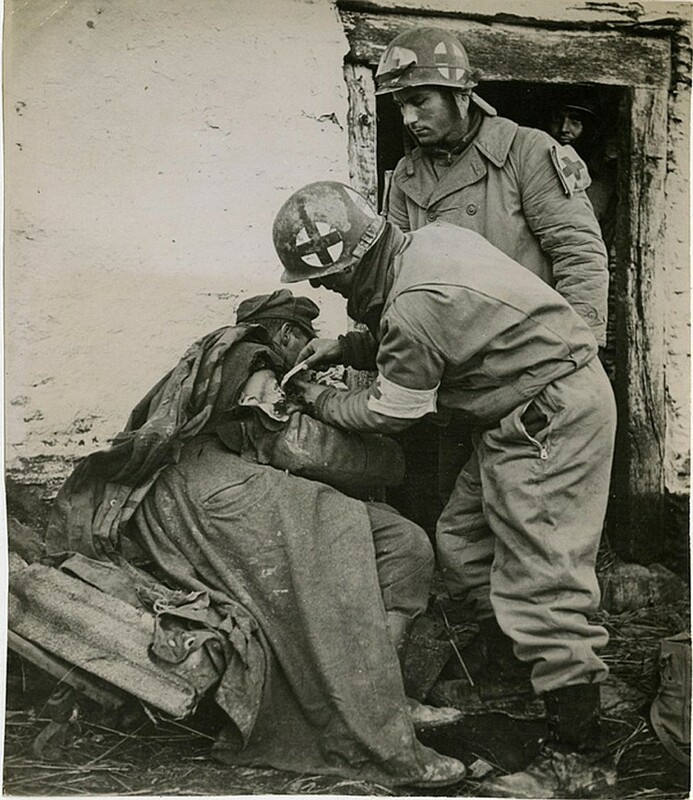 This photograph printed in the silver gelatin print has a red date stamp attached showing “WAR FILE 5 Feb.1945”, as well as the sentence: “American medical corpsmen treat a German paratrooper's shoulder wound during the Yank drive to relieve U.S. troops trapped in Bastogne by the German December breakthrough into Belgium and Luxembourg”. ROBERT CAPA. "Collaborationist with shaved head" (1944). Photo: Be-Hold. This silver gelatin ferrotype and seal of Acme News Service was taken on August 18, 1944, and published shortly after in the LIFE magazine on September 4th, 1944. In addition to the various annotations made in pencil or pen on the back, there is a paper hooked, where it can be read: “COLLABORATIONIST IS SCORNED BY HER PEOPLE. CHARTRES, FRANCE. Followed by jeering townspeople, a woman collaborator is led back to her home after having her hair shaved off. The shorn woman carries a German baby...”. The photograph insinuates an aggressive tone as the people are turned towards the woman with the shaved head. 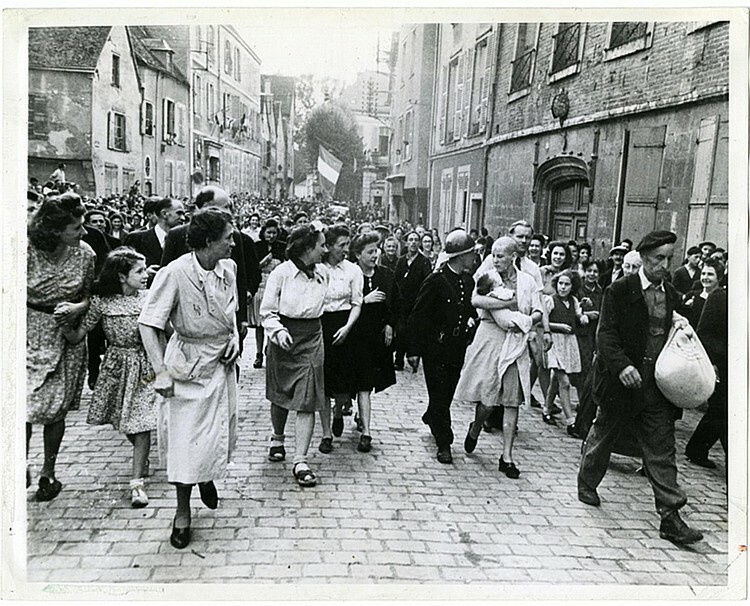 Public humiliation and shaving of the head was a punishment for French women who were engaged in sexual relations with the German soldiers during the occupation. This iconic photograph has grown in importance during the decades since it was taken. ROBERT CAPA. "Snowy field". Bastogne (1945). Photo: Be-Hold. This snowy field by Robert Capa was published in LIFE magazine in January 1945. 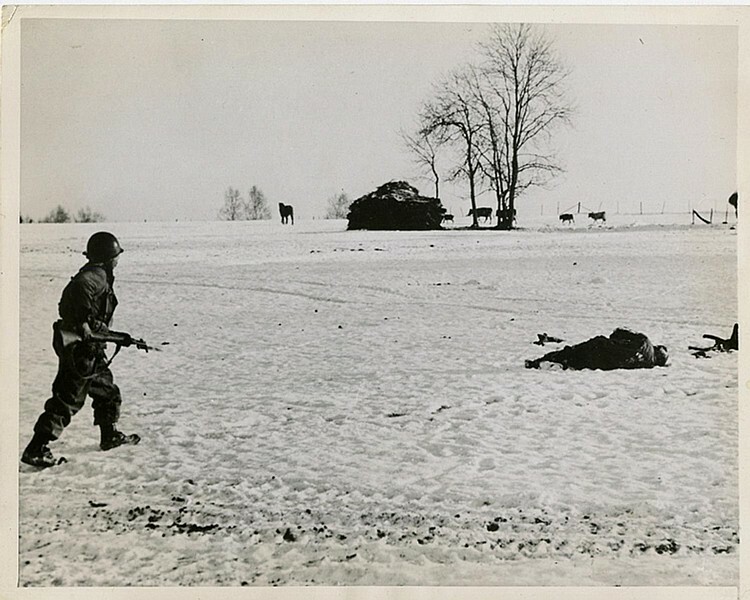 On the reverse side it reads: “Advancing cautiously across a snow-covered field, an American soldier nears the spot where a Nazi fighter lies. He keeps his gun ready for use at a moment's notice until he finds out whether the man is dead or alive.” The photograph is hauntingly beautiful despite the growing unease of the horrors that await. ROBERT CAPA. "Tanks". Bastogne (1945). Photo: Be-Hold. The same goes for “Tanks” from 1945, which also comes with the seal of International News Photo. 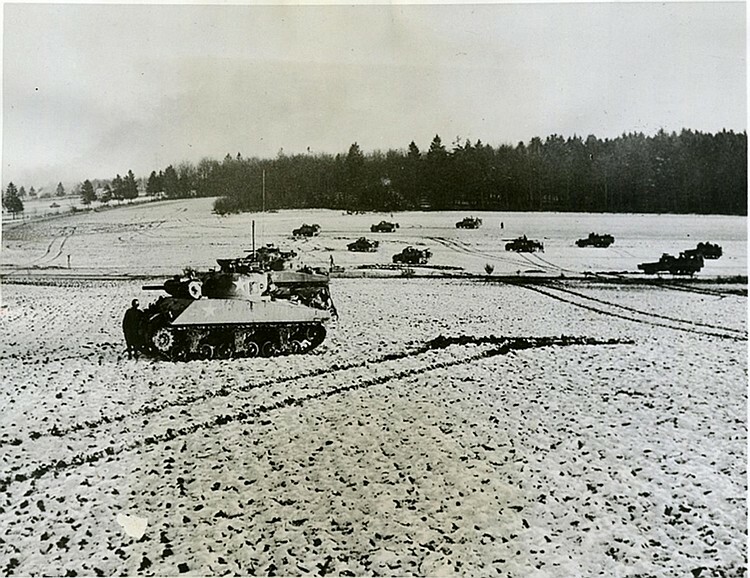 The note on the photographs back reads: “ON THE LAST LAP TO BASTOGNE… Tanks of General Patton's third army deploy on a snow-covered slope… as they prepared to launch the final drive that crashed through the German ring around the embattled 101st American Airborne Division. In background rising snow marks damage to enemy installations by artillery fire that preceded the armored thrust into Bastogne itself.” The dramatic photo was published in LIFE magazine in January 1945 and in Illustrated Magazine later the same month. ROBERT CAPA. 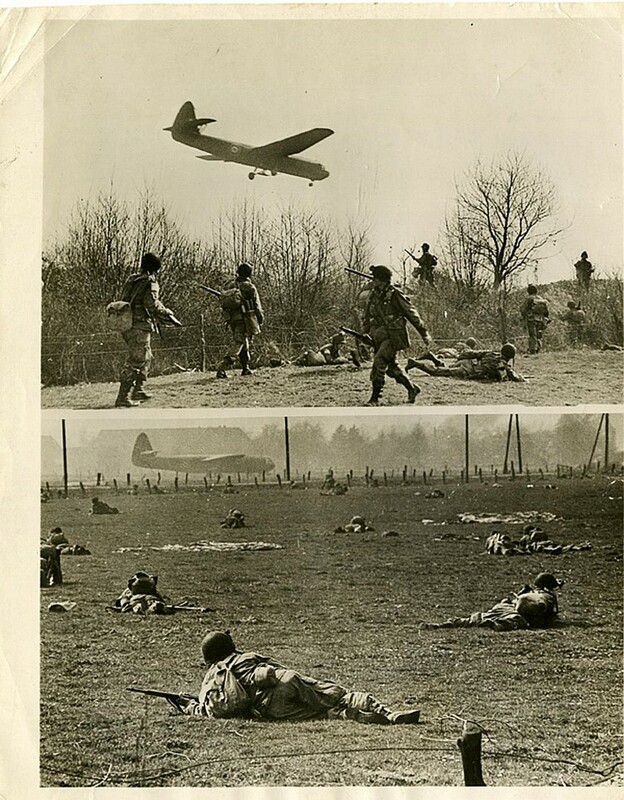 "Gliders & landing troops near Wesel" (3/31/1945). Photo: Be-Hold. This photo depicts the first of the allied airborne army landing in east Germany, next to the river Rhine. As the first soldiers is revealed, additional gliders carrying troops and supplies are nearing in. ROBERT CAPA. "To Invade" Gelatin silver print with applied pigments (1944). Photo: Be-Hold. This Capa photograph is printed in gelatin silver print with applied pigments. It captures the D-Day invasion on June 21th, 1944. This iconic photo is one of Capa’s most famous and includes a newspaper clipping on the back describing how the American troops in France during WW1 made their way across the landscape towards the upcoming battle, linking the two wars together. ROBERT CAPA. 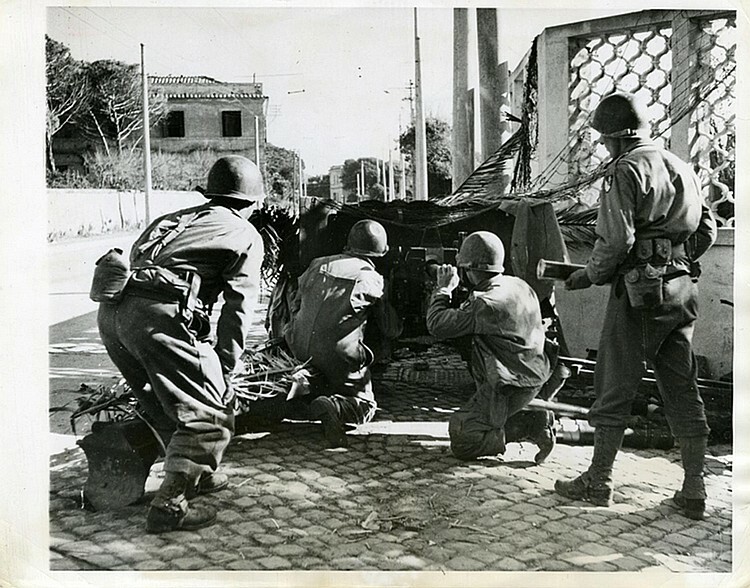 "Anti-tank gun near Anzio". Silver gelatin (1944). Photo: Be-Hold. Clearly, the impact Robert Capa has had on documentary photography and war correspondence through the art of photography cannot be overstated. His iconic photography shows the horrors of warfare in a way few others have accomplished. The Be-Hold’s “Exciting Photographs” will be held June 27, and can be found at Barnebys.